The abrupt evacuation, coming as the river rose just over 15 feet (4.57 meters) above flood stage - slightly exceeding the previous record of 32.1 feet (9.78 meters) - appeared to take authorities and residents by surprise. Water entering the reservoir from that storm marked the greatest volume measured there in 120 years of recordkeeping, said John Remus, chief water manager for the Army Corps' Missouri River basin. The downstream flow, breaking flood stage records at several locations along the river, has placed enormous strain on the region's system of flood-control levees. 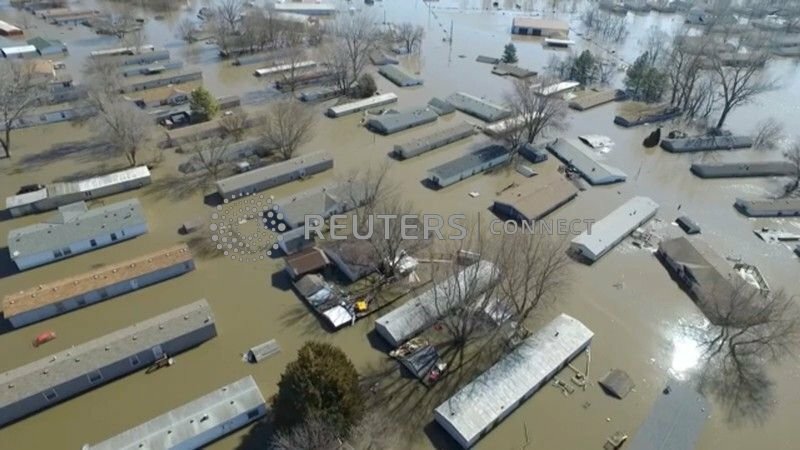 Nearly 50 levee breaches have been confirmed in the Army Corp's Omaha district alone, encompassing the hardest hit parts of Nebraska, Iowa and Missouri, officials told a news briefing. President Donald Trump on Thursday approved a disaster declaration for Nebraska, making federal funding available in nine counties ravaged by last week's floods. Iowa Governor Kim Reynolds on Friday requested a presidential disaster declaration for 57 flood-stricken counties in her state. Sorry but no sympathy for people knowingly living behind a series of FLOOD PLAIN LEVIES and are surprised when they fail and the river slightly exceeds it previous high water mark. They’ve been warned yet try to defy Mother Nature and want everyone to help pay for their recovery while blaming it on global warming,,,oops it’s climate change now. It’s all crap in my opinion and has been going on for years on the east coast beachfront to the point now they’ll only rebuild your home once and next time is out of your pocket. There’s a reason why the French Quarter didn’t flood during Katrina and it’s not because the pumps didn’t fail it’s because the French took the high ground. Go Fund me isn’t new the federal government has been sending money to cover people’s poor decisions for years. If you build on a flood plain, build on stilts. a stretch of﻿ the﻿﻿ r﻿iverfront known as "the Bottoms.﻿"
I'm from Missouri. I don't know how widespread the word "bottoms" is around the world, but where I'm from, it refers to low land that is expected to flood. It's a river bottom. Makes great farmland, but not a great place to build. When making disparaging remarks about the unfortunate folks facing this disaster, keep in mind that this is record breaking. Records have been kept for the past 120 years. Consider this: The Garrison Dam, in North Dakota was built in the mid 1950's and the Oahe Dam, in S. Dakota, was finished by 1960. They control huge volumes of water and, at the time, almost guaranteed a halt to everything but minor flooding. This unprecedented flooding is way beyond what any prudent person would expect. I think a little compassion is in order. where are the climate change believers? can't this be blamed on climate change? How is it that a polar bear choking to death on the bones of a baby seal it's devoured is a clear indicator of climate change and global destruction, but when a bunch of regular mom/pop with kids families are caught in flood, these same climate change believers state... it's just because of their own doing?